My last share of these 15 days is a very personal one. My colleague & friend, Beth Kingsley (@bethkingsley13) & I created this site. We very much enjoy creating templates for activities that can be used in any classroom. This site is built from a love of teaching and learning. 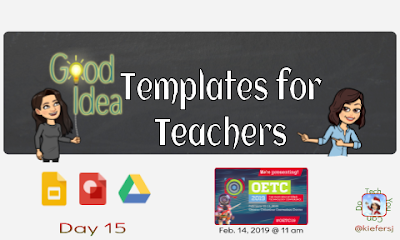 Please feel free to click on any of our templates, preview them and then click the "Use Template" to make it your own. You are welcome to modify as needed. Our hope is that you find something here that can serve you and or your students soon! We will be working over the next several weeks to provide a better organization to the site ... so for now, please scroll through. We look at this site as a work-in-progress for sure! There is even a place for you to submit a request for a template we can create & share. We 💖 this stuff! Finally, we are excited to announce we will be presenting at OETC (the Ohio Educational Technology Conference) on February 14. We'd love to see you there! We will spend some time sharing our site and then dive into "how" we create what we do, then provide some time for you to create!